The hotel is a true gem, skillfully and faithfully renovated to enhance its original noble featuresd. Most of the 42 bedrooms and suites still retain many signs of a glorious past, including superb masterpieces by important 17th and 18th century Venetian artists such as Nicolò Bambini, Giambattista Tiepolo, Sebastiano Ricci and Pietro Longhi – a rare example of time having stood still. Each room is uniquely decorated in a classical and elegant style and in keeping with the deep history of the fine 'palazzo' building. L’Alcova Restaurant on the Grand Canal: With its splendid panoramic terrace on the Grand Canal, L’Alcova Restaurant is open all year round to allow you to indulge your passion for Venice and your love for the best food and wine. In an exclusive setting, the Restaurant offers original cuisine based on the local Venetian traditions. The Rialto market is just in front of the hotel: just cross the canal to experience the seasons of the sea and the fresh products. L’Alcova Restaurant is an eloquent expression of the Mediterranean creativity, where you can encounter the wonders of Venice at your fingertips. The hotel's Chef Josef Klostermaier: The absolute protagonist is a cuisine made of fresh ingredients and characterized by a strong 'back to nature' concept. Local produce is enhanced in the menus, through the daily attentive personal selection from the Rialto Market, renewing the traditional. Chef Klostermaier’s Bavarian origin and international background can be savoured on his refined natural plates, characterized by rich tastes and great personality. A ‘Natural Flavours’ Philosophy providing a fresh twist on traditional Venetian cuisine. Bar L’Incontro: Bar L’Incontro offers an ideal respite and is set to become a destination on its own both for Venetians and Guests. A distinctive lounge atmosphere for conversation in privacy and style, light meals, innovative drinks and afternoon teas. Several function rooms available of various sizes. Ability to seat up to 150 persons in the largest function room (183 m2). For more detailed information, rates and availability please contact the Stylish Places to Stay concierge team. The hotel has an enviable setting overlooking the Grand Canal and one of the most panoramic corners of Venice, facing the historical Market, between Ca’ D’Oro and Rialto Bridge, the hotel is only a short walk away from St Mark’s Square, the main museums and the best fashion boutiques. Yet it is also right in the bustling district and trendy area of Venice, full of local shops and restaurants. Venice Marco Polo airport (Tessera). The hotel is approximately 30 minutes by water taxi from the airport. The hotel can be reached by a private water taxi, at the price of about € 100,00, approximately 20 mins. There is also a public bus to Piazzale Roma (approximately 30 minutes). From Piazzale Roma, Ca’ Sagredo Hotel may be reached either by a private water taxi, at the price of about € 70,00 or by public vaporetto at the cost of € 6,50 per person. The Line is n. 1 and the stop is Ca’ D’Oro. 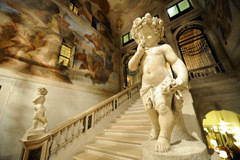 The Santa Lucia train station is situated fifteen minutes from the hotel, at the end of Canal Grande. The hotel can be reached either by a private water taxi, at the price of about € 70,00 or by public vaporetto at the cost of € 6,50 per person . The Line is n.1 and the stop is Ca’ D’Oro.